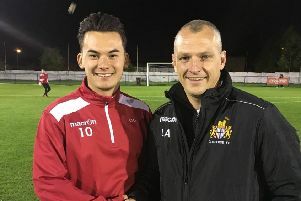 Clitheroe eased through to the quarter-finals of the Partners Foundation Lancashire FA Challenge Trophy with a 4-2 win at North West Counties First Division strugglers AFC Blackpool on Tuesday night. The hosts went ahead after 25 minutes through Ryan Chanley, but two minutes later the Blues were level with a superb strike from the returning Brad Carroll. And right on half-time, Kurt Willoughby put Clitheroe ahead. Alex Newby made it 3-1 eight minutes after the restart, slotting home after great work from Mitchell Bryant. Willoughby put the game to bed with his second on 66 minutes, and Dean Ing netted a consolation shortly after.